Nine launches US drama Forever next week, with a double episode 8:45pm Wednesday February 11th. 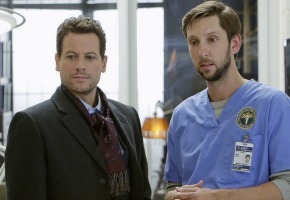 It stars Ioan Gruffudd as a New York City’s star medical examiner studying the dead to solve the mystery that has eluded him for 200 years—the answer to his own inexplicable immortality. It also features Alana De La Garza, Judd Hirsch and Joel David Moore. This premiered in the US in September and has been approved for a full season. criminal cases. Born 200 years ago, he hopes his work also will help solve mysteries about his own mysterious immortality. Henry and Jo scrutinize the conflicting evidence in a bridge jumper’s death to solve the crime. Plus, Henry’s mysterious caller provides a tantalizing clue to his identity. David, just pointing out that you’ve reversed the leading man’s 1st and 2nd name in the copy for your story above! For your penance, could you please have a go at letting us know just how you pronounce either of his names, please. I always thought his name was Ioan Gruffudd..? Have to agree. If you want to watch the first couple of eps in SD and then wonder where it’s gone (time / day / channel) then Nine is “still the one”. However, if you want consistency and HD, there are many better options. I learnt my lesson when I gave nine another chance and watched step dave on gem to have that removed after one episode. Won’t be giving this a try. Still waiting for nine to air Arrow Season 3. I hate to add to the “glass half empty” brigade, but I just don’t trust 9 enough to continue showing this show on a consistent basis. It’s actually got to the point where I prefer 9 (& to a lesser extent 7) debut their shows in a later timeslot. That way, their expectations for ratings aren’t as great & the more likely they’ll be shown at a consistent time. Shows like Arrow, Person of Interest, Suits, Covert Affairs, etc… may not be timely, but at least when they come on, they are shown relatively consistently on a certain night at a rough time. A double episode at that time is ridiculous…. it’ll be gone by mid March! It’s always a bit of a shame when Ch9 picks up a fantasy/supernatural series. When they got Fringe a few years ago with two quality Aussie actors, Anna Torv and John Noble, it lasted a couple of weeks and disappeared all because of the flawed and unworkable Austam ratings system. Real Aussie fans had learned the Fringe codes over a series of months, they were never forgiven for that. Will the same thing happen now?